This creature is for my world building pre-visualization class. Damn Zbrush is hard to get use to OTL. Dat interface is so strange. I DECLARE THIS CREATURE TO BE NAMED DINODOG!!! This reminds me of the Willosaur/Tripod Neuvo, a creature Will Wright created in 2005 when premiering Spore. Wouldn't want to run into that thing at night! Wow! omg i have to create a character in ZBrush too! the interface is so annoying! 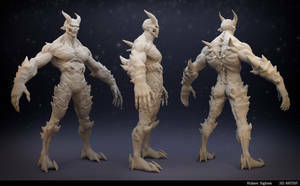 This is so cool /)0O0(\ And I would love to learn how to use Zbrush I've seen a lot of really cool stuff done with it. this looks like a demented creature that someone made from spore creepy and cute pack. Great job!!! Had to have evolved on a planet of low gravity to support a tail of that size, possibly boney, with not much muscle mass in its hindquarters. If the digits were longer on its limbs I'd say it arose in an arboreal environment with the prehensile tail hooks acting as an anchor to aid it in hunting through the foliage of its natural habitat of thick tree branches. I object to the idealization of unrealistically skinny creatures. Your model needs to eat a sandwich. Looks like something I could make in spore! That's so weird, but I like it! Man, that'd make a superbly adorable pet! Now drop it into Spore and watch it eat everyone. Reminds me of some of the dinosaur models at my favorite museum. I consider myself creative but this is just so unique and amazing that just..... Wow. This is what I wish Spore actually looked like. This reminds me a LOT of the cat monster in the PS1 game Parasite Eve. Just thought I'd share.